Freedom Historical Society (FHS) is selling raffle tickets for a unique one-of-a-kind queen size quilt to benefit FHS. Proceeds from the raffle will be used to construct stair access to the unique antique carriage and wagon display in the lower shed at the FHS Museum in Freedom which, to date, has no safe access. The public is invited to join FHS members in purchasing raffle tickets to win the opportunity to wrap yourself in a bit of Freedom history. Inspired by the FHS receipt of a donation of a 30-year collection of Old Home Week T-shirts, Freedom’s own Nancy Ferry generously offered to design, stitch, and assemble the quilt using a selection of Freedom Old Home Week shirts chosen from the collection. She skillfully quilted and crafted a beautiful heirloom quality creation which was finished with a hand-guided design on a long-arm quilting machine. Raffle tickets cost $5 each or 3 for $10 and are available at the Freedom Village Store, on our website store, and by mail. Tickets will also be sold at various events and venues around Freedom throughout the summer. See instructions below. Additional information about the raffle and ticket sales can be obtained from Nadine Chapman at 603-539-6594 or tfichapman@gmail.com. The drawing will be held on October 19, 2016, at the FHS Annual Meeting at Freedom’s Town Hall on Elm Street. To purchase tickets online using PayPal, click here to go to the Store page. 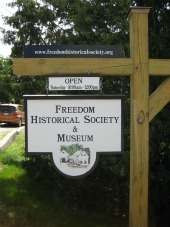 To purchase tickets by mail: Provide your name, email, address, phone number, the number of tickets you wish to order*, your check for the appropriate amount payable to the Freedom Historical Society, and mail together to FHS, Box 548, Freedom, NH 03836 so that we receive it before October 19, 2016.